The race to become the preferred choice among three leading open source Cloud software stacks Openstack, Cloudstack and Eucalyptus has been on for some time. However, it has picked up significant momentum in the last 2-3 months. Many factors are contributing to the accelerated phenomenon. First and foremost has to do with the realization about the business value of implementing a private or a hybrid cloud. For example, virtualization is reaching the so called "maturity phase," while the Cloud Software stack is enabling IT to new levels of access, management, charge-back and authentication of isolated pool of IT resources such as application, compute, storage, and network. This represents yet another key step towards self-service and more optimum utilization of your data center resources. Second, there are many "early adopters" across multiple industries who have implemented both private and hybrid clouds. These include both Cloud Service Providers (CSPs) and end-users. They have leveraged any one of the three open source cloud stacks in combination with off-the-shelf-SaaS-cloud services. Third, the more obvious, reason has to do with the fact that traditional platform vendors like IBM, Dell and HP need to protect their current and future software, hardware, systems, solutions and services revenue. Announcing or offering and supporting Private and Hybrid cloud-related projects and products helps them a great deal in potentially better managing their platform revenue and profitability commitments. 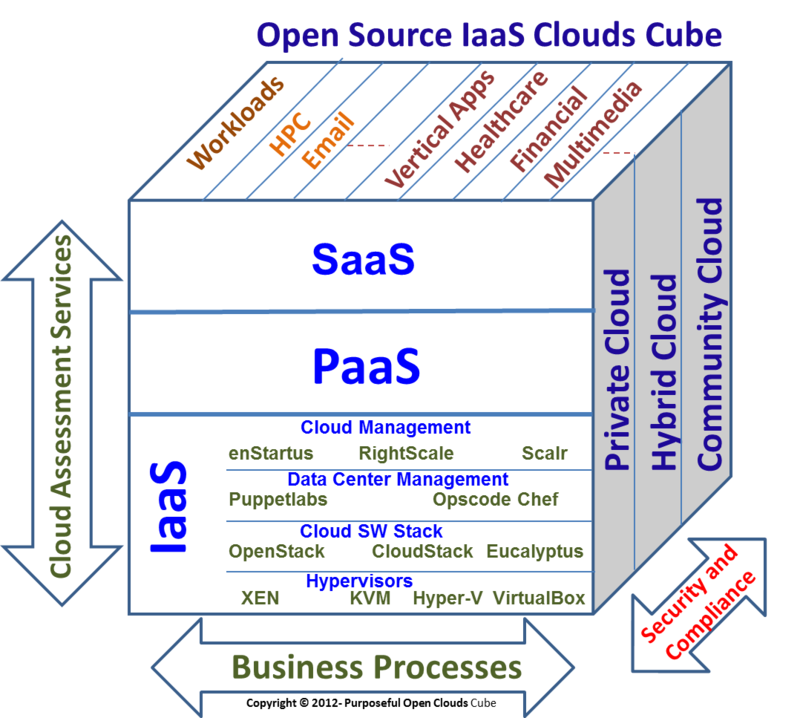 Each of the three open source cloud stacks have built and earned sufficient bragging rights to deliver an acceptable solution. However, each one of them also represents risk and challenges as you leverage them in implementing a private or a hybrid cloud for a set of workloads in your business. You need to make sure that you pick the stack that best meets your business needs. Purposeful Clouds will continue to actively monitor their evolution, build upon our detailed selection criteria for various vertical markets, test all three stacks in Purposeful Clouds lab and continue to share our findings with you in our blogs and on our website. In this document in Cloud diagram you forget to specify most popular Hypervisor "VMWare"
This article neither compares or contrasts the three architectures. Very poor. As you know, each application or workload will have its own set of requirements. The ten decision criteria listed above should give a real good start. We will be happy work with you for your specific use case and providemore detailed comparisons as well as recommendation/s on Cloud stack/components.